However, a number of genes can affect eye colour. Amber eyes usually occur when the eumelanin produced by the dog is diluted or modified by the recessive genes in the B or D series. In other words, all liver dogs (bb) have amber eyes, and so do blue and isabella dogs (dd). Amber eyes vary from light brown (overlapping with the lighter eyes sometimes found in black-pigmented dogs) to yellow, yellow-green or grey. Isabella (dd) Weimaraner, showing very pale eyes that almost match the shade of its coat. Liver grizzle/agouti Siberian Husky. 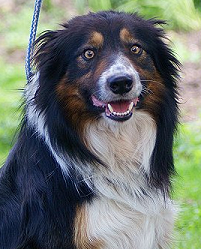 The pink/brown nose gives this dog away as a liver. 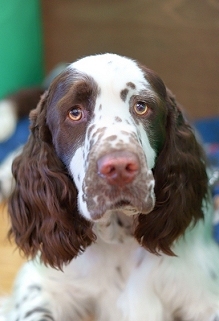 This English Springer shows very light amber eyes for a liver. Although amber eyes most commonly occur on liver and blue dogs, they can also occur occasionally on dogs with black pigment. The striking shade shown by the first dog here is often referred to as copper. 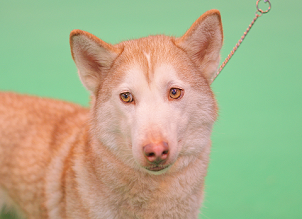 The eyes of the second dog are paler and more of an amber shade. 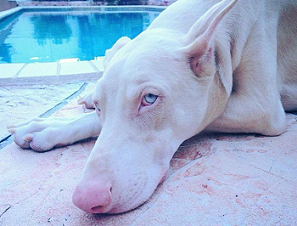 Genetically, there are four ways a dog can have blue eyes. Three of these are linked with pigment loss in the coat. The most common way is as a side effect of the merle gene. Merle dilutes random parts of the pigment, including the eyes and nose. This sort of dilution causes blue colour in the iris (contrary to common belief, animals with no pigment around their eyes do not always have pink or red eyes like albino rodents do - lack of pigment or very diluted pigment often results in blue eyes, as it does in albino humans). 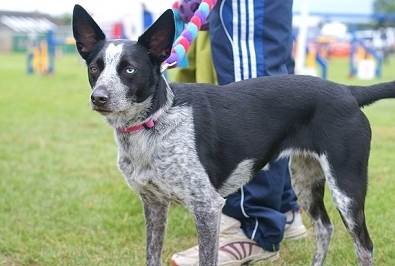 Because of the random pigment loss, often merle dogs have "butterfly" noses (see nose page) and blue, wall or split eyes. Wall eyes, technically known as heterochromia, are when a dog has one blue eye and one brown or amber eye, and a split eye has some blue in it and the rest is brown or amber. Split eyes vary from mostly blue to mostly brown or amber. 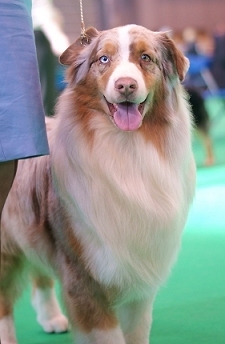 The more dilution there is in the coat of a merle (i.e. the more grey/diluted areas), the more likely they are to have blue eyes or a butterfly nose. 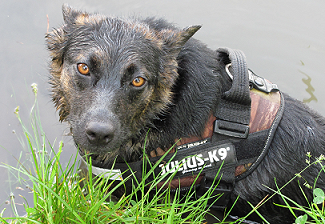 A heavily merled dog (large areas of black or liver) is unlikely to have either of these traits. Double (homozygous) merles are highly likely to have blue eyes and a completely or almost completely pink nose because of the combination of merle dilution and large amounts of white around the face (see below). This red (liver) merle Aussie has one amber eye (because of its bb liver pigment) and one blue. If you look carefully you can see a sliver of blue in the amber eye. 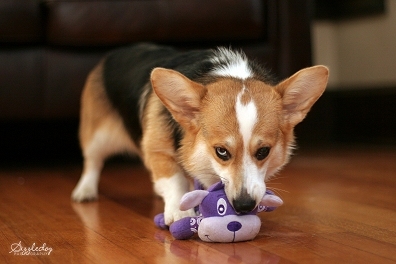 The merle Cardigan Welsh Corgi shown here has two solid blue eyes. The second way in which blue eyes can occur is when a dog has large amounts of white around its eyes. White areas on the coat are where the cells are unable to produce any pigment, so if these areas spread to the face then there may be pigment loss in the eyes and on the nose, making the nose pink and the eyes blue. This only tends to occur on very high-white dogs with the extreme spotting pattern, such as white Boxers, and even then is fairly unusual. The third way is when a dog is affected by albinism. 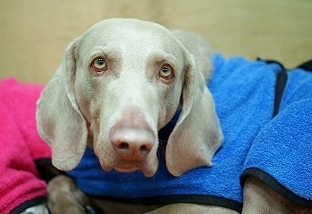 There are no confirmed cases of full albinism in dogs, however "white" Dobermanns have a very light coat (with the main coat appearing as a very light isabella colour and the tan points light cream), blue eyes and a fully pink nose, and this has been proven to be an intermediate form of albinism. Lastly, blue eyes can be inherited as a completely separate gene, unaffected by coat colour. This gene is, however, rare. 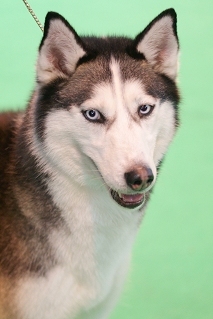 It occurs occasionally in the Border Collie and similar breeds, but mainly it's seen in the Siberian Husky. Huskies can have one or both blue eyes, regardless of their main coat colour, ranging in shade from almost white to sky blue. This is particularly striking when seen on black dogs. As you can see, both dogs have full black nose pigment and black around the eyes (eye rims), so the only explanation for the blue eye on the dog on the right is that it is inherited separately to coat colour and pigmentation. A Husky with two blue eyes. 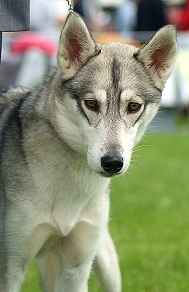 This mixed breed has wall eyes, but is not a merle (the greyish areas are roaned white). 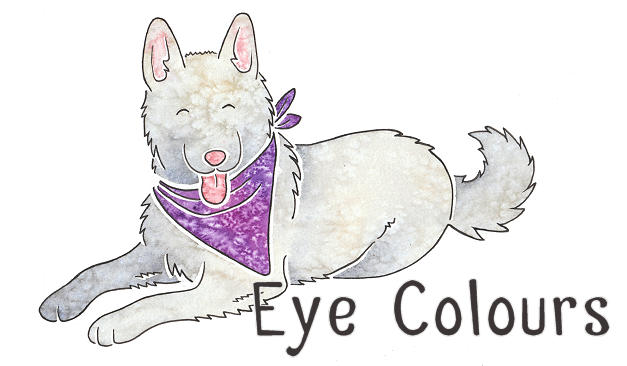 This means it must have the independent blue eye gene, which is most likely from a Border Collie or Husky parent. 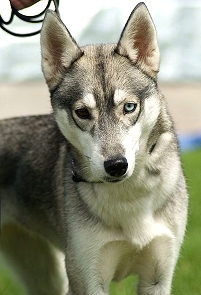 The large amount of Husky crosses with blue or wall eyes suggests that the independent blue eye gene is dominant, in Huskies at least. 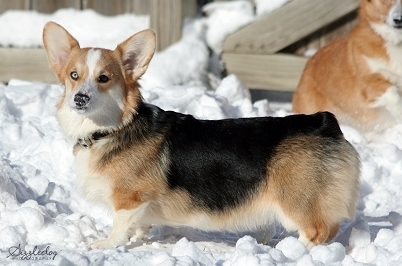 This beautiful Pembroke Welsh Corgi is another example of the independent blue eye allele. 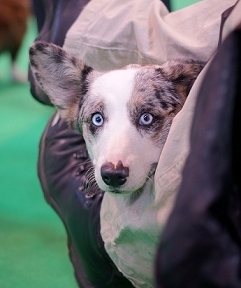 On a dog such as this (with no more than 50% black) it can be impossible to tell if a blue eye is due to the dog being a cryptic merle (i.e. one with very little visible merling), however in this case we can be sure that Revy is not a cryptic merle because the merle allele does not exist in the breed. Neither of Revy's parents had blue eyes, but one of her grandparents has thrown blue-eyed puppies, implying that this is a different blue eye allele to the one found in Huskies, as it is apparently recessive. 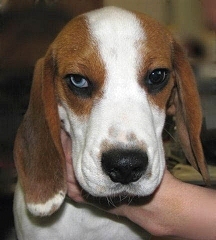 The recessive blue eye allele also appears to occasionally crop up in Beagles such as this one. Note the jet black eyerim pigment and the colour surrounding the eyes, proving that the blue eye is not due to white spotting.